The Sand Diver, or Sand Diver Lizard Fish as it is often referred to is a species most commonly found floating alongside reefs, and often wrecks. This curious creature is also hailed as one of the top 20 ugliest fish in the Caribbean, but we think that’s a tad harsh! 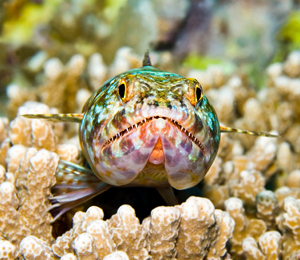 Sand divers belong to what’s informally known as the lizardfish family, as most share similar if not identical characteristics. 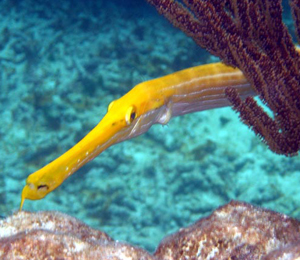 Like most of the reef species here in the Bahamas, their distinctive in their features with very long, cylindrical shaped bodies that range in size from 4 - 14 inches. Once you see their head, it becomes immediately apparent why they’re called a ‘lizard fish’. It’s wide reptilian mouth, and far-set eyes give it a somewhat unpleasant look. Perched on the middle of its back sits a fanned dorsal, with two pectoral fins on the underside of the body, so at first glance, it always appears as if they have webbed legs. Their bodies are white and tan, a feature essential for camouflaging into the sea floor below, and with its dark splotches somewhat resembling spilled ink-blots, it’s both a difficult prey to catch and an excellent hunter. Sand Divers thrive in tropical and subtropical environments the world over, which is why they’re plentiful in the Bahamas. They are avid bottom dwellers, so if you’re out on a Bahamas snorkeling expedition, depending on how deep you dive, you may only get to see them if you’re scuba diving, or exploring a wreck. 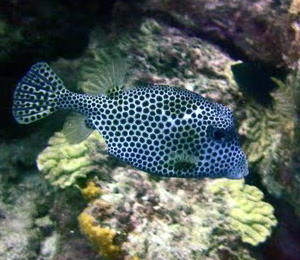 If you’re looking out for this species specifically, be sure to peek around sand patches next to the reef, underneath rocks, or near coral, with their backs to it for protection. Remember to bring your underwater camera and do your best to stay as still as possible, they’re a little more shy than some of the other species you’ll find here in the Bahamas.